The Coin Slide is an ultra-simple trick for young kids to learn and perform. It’s available from any magic dealer and many toy stores for less than a couple of dollars. Since it's a mechanical trick - it does all the work to make a coin disappear and reappear - it's a perfect first trick for a youngster. Even young kids can learn to perform the trick and understand it's mechanics. Purchase one of these coin slides and insert a penny, and you're just about ready to go. 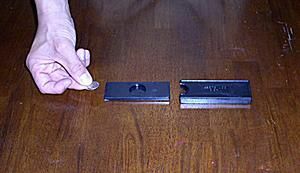 Effect: A coin is placed into a tray which is slid into a small box. When the tray emerges, the coin has vanished. When the tray is reinserted back into the box and pulled back out, the coin has returned. If one likes, this trick can be performed as a production effect. In this case, you would start with the tray empty and then slide it into the case. And when you pull out the tray, a coin is found to have magically appeared. With the trick, you get a box and tray. You provide the coin. In this example, we're using a dime. Pull out the tray halfway from its housing or box and place the coin into the tray in the hole that's provided. Slide the tray into the box. If you like, you can utter a magical word. When you pull out the tray, the coin has disappeared. Freely show the tray and allow spectators to look inside of the box. Push the tray back in. When the tray emerges, the coin has reappeared. This trick with a marketed prop provides a mechanical way to cause a coin to vanish. Admittedly, this one is easy to figure out and as a result, there are far more baffling ways to vanish a coin that you can learn through our step by step instructions. We'll briefly describe a few of them to you here when you're ready to move on. In this aptly named easy magic trick, we show you how to create a gimmick to vanish a coin. All you need are materials and tools found around the house. In this trick, you vanish a coin under a set of rings. You bring out two rings and after laying them over a coin, the coin is seen to have vanished. But no worries, you can easily bring it back. If you're with a group of friends or family, here's an easy magic trick that allows you to vanish a coin right under everybody's noses. This one is particularly baffling. In the trick, you place a coin under a handkerchief and in the name of fairness, walk around and let everyone check to see and verify that the coin is indeed under the handkerchief. At a moment that you choose, the coin magically vanishes. This one is a sleight of hand based technique to vanish a coin. It's actually a move and all you need is an ordinary coin. Just learn from our step by step instructions how to vanish a coin at any moment that you wish. Once you learn the technique, you'll always be ready to perform some magic with just about any coin.